Have you been trying to get ripped but it just seems like that weight just won’t fall off? Or maybe, you’ve even been trying to get ripped but your muscle growth seems slow? Well, maybe, the exercise regime that you are following just isn’t working for you and we have found something that might. We introduce Crossfit. Crossfit is a fitness regime that was developed by Greg Glassman that involve varied functional movements at high intensity. It incorporates elements of running, rowing, weightlifting, gymnastics and more; in other words, it’s brutal but it gets the job done. This fitness method has garnered quite the following and it’s easy to see why since it yields an intensity that just aren’t part of other fitness programs. So, every week, for the beginner and the pro, we’ll be posting some exercises that you can do right in your home. Grab the pull up bar with both hands firmly, palm facing away from you. Make sure that your back isn’t arched. Slowly pull yourself up until you have at lifted your chin past the bar. Lower yourself to resting position. P.s. Your back shouldn’t arch and you shouldn’t swing. Just straight up and back down. 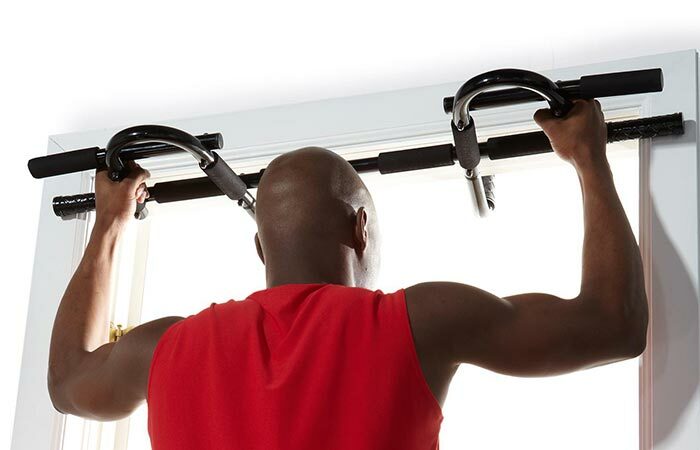 Pull-ups work a variety of muscles that include the biceps, triceps, forearms and even your shoulders and back muscles. It’s even known as being the king in back development. Yes, 100 sounds crazy but this is just the beginning of the regime. We did tell you that it was intense. Pull ups will work many different muscles like biceps, triceps, forearms, shoulders and back muscles. We recommend that you get yourself the ProSource Heavy-Duty Doorway Trainer that features 12 different comfortable grips that allow you to perform a variety of exercises and alternatives to the pull-up such as chin-up, alternate grip pull-up and The Commando Pull-up. Best part is that it can easily attach and detach from any door. 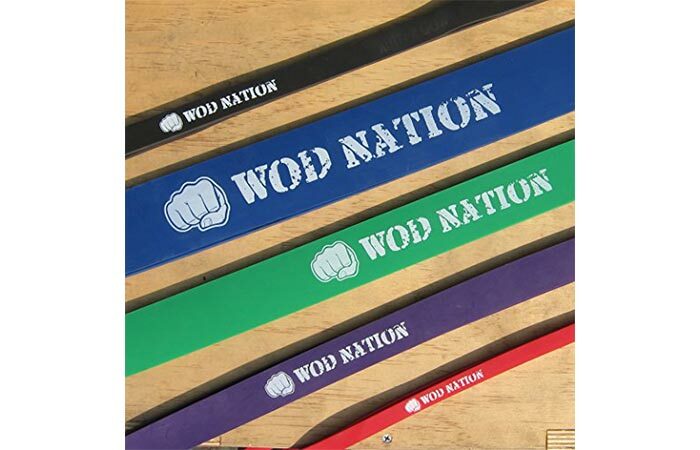 Resistance Bands Exercise Band by WOD Nation. Beginners might not be able to get over the top of the bar in the starting stages so we also suggest that you get this assistance/resistance band by WOD Nation that aids you in completing the entire repetition and that can be used for various other resistance exercises and assists. Push-ups are fairly simple to do. Place your hands firmly on the ground approximately in line with your shoulders. Make sure your toes are firmly on the ground with your heels in the air. P.s. Once you’ve gained some strength, you can modify the pushup by raising your legs on a chair to give you a more intensive upper body workout. Push-ups are an excellent way to build your chest, shoulders, upper back and as secondary, your biceps and triceps. Push-ups work your chest, shoulders, upper back, biceps and triceps. Doing 100 push-ups can be quite intensive on your hands and wrists so we suggest that you get yourself a pair of these Push Up Elite handles by Perfect Fitness that take the strain off your wrists and allow you, with the use of ball-bearings, to change your grip so that you can focus on particular muscles. This exercise is simple but can be somewhat difficult to do correctly. With either your dumbbell or kettlebell on the ground in front of you, you slightly bend your legs. Keep your back straight and firmly grip the weight. Swing it between your legs. When your arms hit your legs, you straighten your legs and use the momentum to swing the weight forward until about eye or shoulder level. Then let it drop back between your legs. 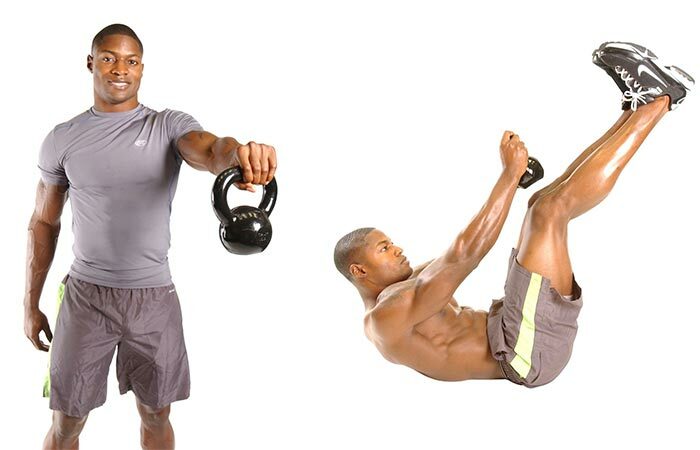 The kettlebell swing is an excellent way to burn fat as well as to build muscles. It works muscles in the hips, hamstrings, glutes, shoulders, pecs, lats and abs, as well as improves your grip strength. It’s your choice if you want to use a kettlebell or a dumbbell for this exercise but you do need a dumbbell if you want to get serious about working out. This is an excellent solid PVC coated dumbbell with grip by CAP and 35 lbs is a good starting weight for the swing as well as other exercises. If you’d prefer to get a kettlebell for this exercise since it makes it much easier, this one is also highly recommended and manufactured by CAP. This is a simple and yet, super-intensive exercise. With your feet shoulder width apart and your knees, hold the medicine ball above your head. With as much force as possible, throw the ball down in front of you while exhale and contract your abs as much as possible. If you can, catch the ball as it bounces from the floor but if you couldn’t, or there’s no bounce, keep your ab muscles contracted and pick the ball up. P.s. You have to use a non-bounce medicine ball otherwise you might lose some front teeth. Ball slams are mainly a cardio exercise that make you lose fat in front of your very eyes and, of course, they carve out abdominals that even the Spartans would have been proud of. We highly suggest that you get this Slammer Medicine Ball by Plyometric. 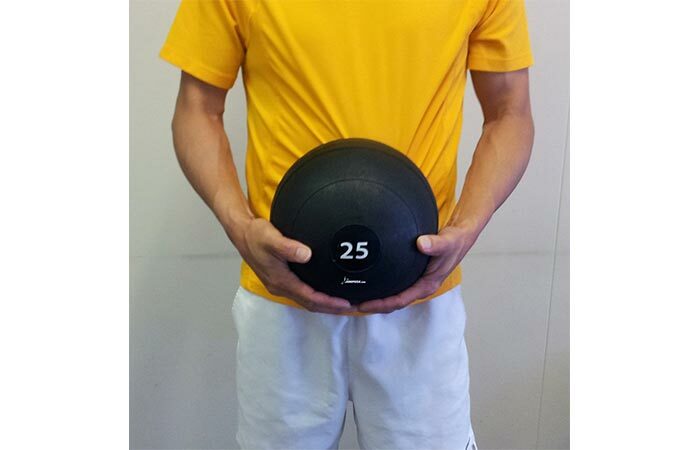 25 lbs is a good starting weight for this exercise and this ball was built for the job. It can also be used as an exercise aid for crunches and other exercises.